SAN FRANCISCO -- It turns out the Hunter Strickland-Bryce Harper fight did leave a player injured, but it wasn't one of the two main participants. Michael Morse was put on the concussion disabled list a few minutes before Tuesday's game and the Giants recalled Kelby Tomlinson to take the open roster spot. 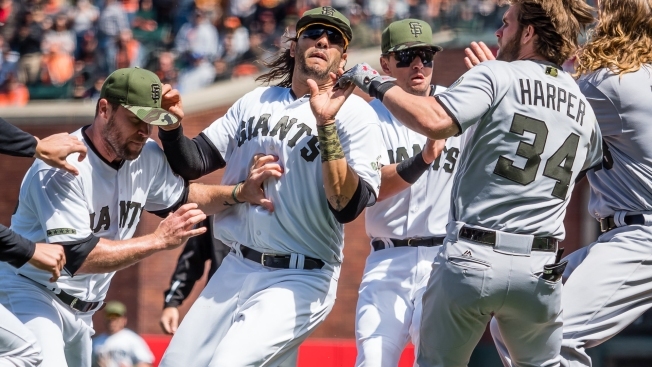 Morse and Jeff Samardzija collided in the middle of the pile Monday after Strickland and Harper exchanged punches. Both players went down hard. Approached by reporters after Monday's game, Morse said he was fine, and he said the incident was no big deal. Before Tuesday's game, Harper said he was glad his former teammate got in the way. "Samardzija saw blood a little bit, I thought," Harper said. "I'm very thankful for Mikey Mo. That's a big spot with him coming in there."